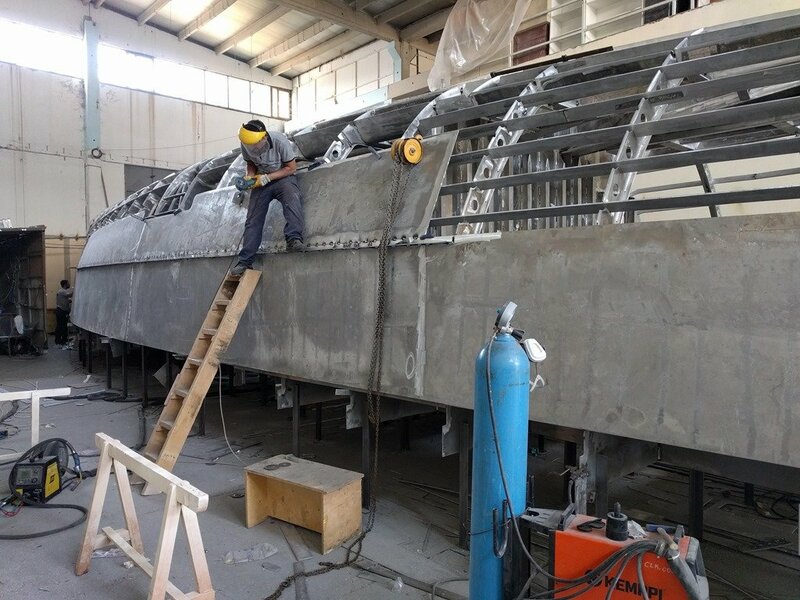 It was a full work week here for Team Möbius at GreeNaval and as you are about to see, the progress to match. As per my attempt at a fun title the focus this week was on the two ends of the boat, the Bow and the aft Engine Room & Workshop and much more progress on putting up more hull plates. 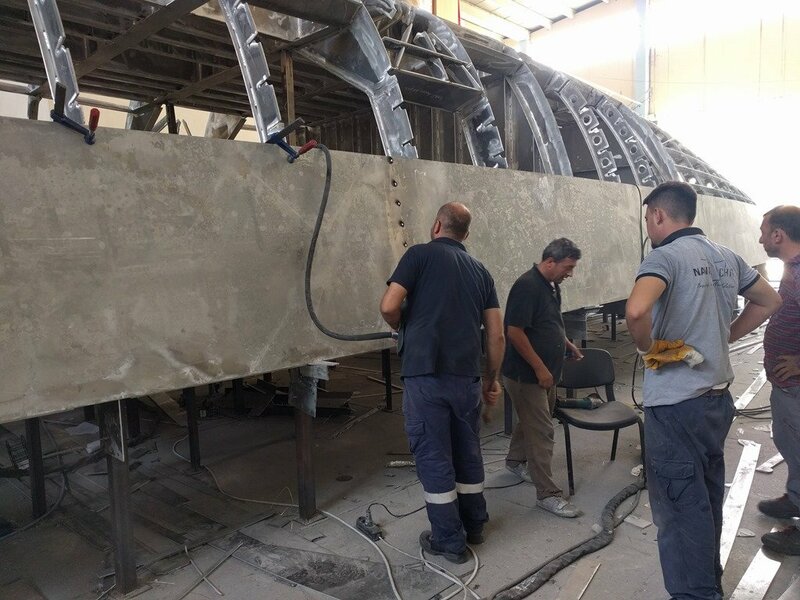 The shape of the boat is now coming into focus more and more on an almost daily basis and you will need less and less “AI” or Augmented Imagination to visualise what the finished hull will look like. LOTS to show you and pictures are much better than my words so I’ll jump right in. Starting right side up here is what the finished bow will look like viewed from the Port side. We’ve made a few modifications since this early rendering such as just one Samson post but these shots are pretty close to what the final bow will look like. The tiny little 125kg/275 lb snugs right up to the eXtremely robust anchor roller assembly Dennis has designed and you’ll see that “in the flesh” in the pictures below. The access hatch you see on the aft Starboard side is for getting in and out of the very large storage space below the Foredeck. Both these renderings show quite clearly how the anchor deck area slopes down to that big solid aluminium “doughnut” in the very front of the bow so that all the anchor muck and deck water is all self draining and runs right off and out through that big solid AL doughnut. We try to have as many parts on the boat as possible serve double duty and the primary purpose of this doughnut is to run our snubber line out to the anchor chain with a well centered and fully faired exit/entry. For a snubber we typically use a length of triple strand nylon, about 5-10 meters which we clip onto the chain once the anchor is set and then tied to the boat on that Samson post and the anchor chain let out so that all the tension is on the snubber. The stretchy nylon acts like a shock absorber as the winds and waves come up in an anchorage and takes the load off the windlass. 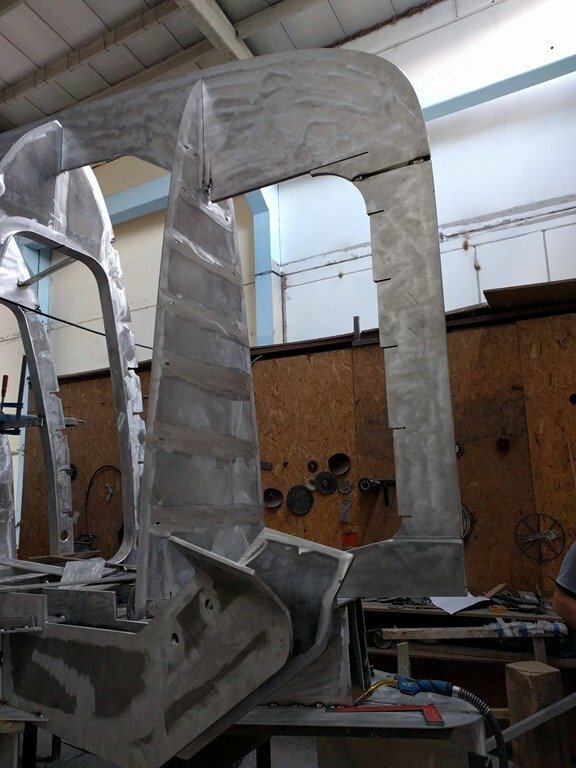 To help with both your orientation and visualisation, this is what the finished bow framing will look like, viewed from its current upside down perspective. 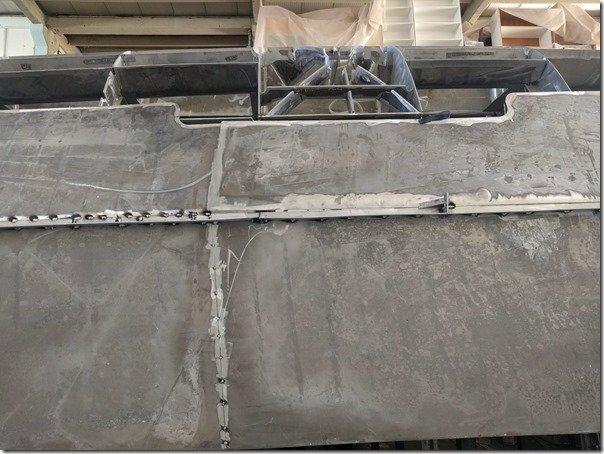 OK, now that you are all oriented, here is how the real bow looked on Monday morning (June 18, 2018). That wide vertical plate, known as a Stem bar curves around the bow and heads back down the centerline of the entire hull creating a single 25mm thick Keel Bar running all the way to the very aft end of the swim platform. It is massive in the eXtreme, many times more than the most stringent of any open ocean class certifications and that is very purposeful on our part as yet another SWAN or Sleep Well At Night factor. Stepping back a bit to put the bow in perspective relative to the rest of the hull you can also see that anchor roller assembly in these shots and begin to get an idea of just how eXtremely robust this critical part of the boat is. 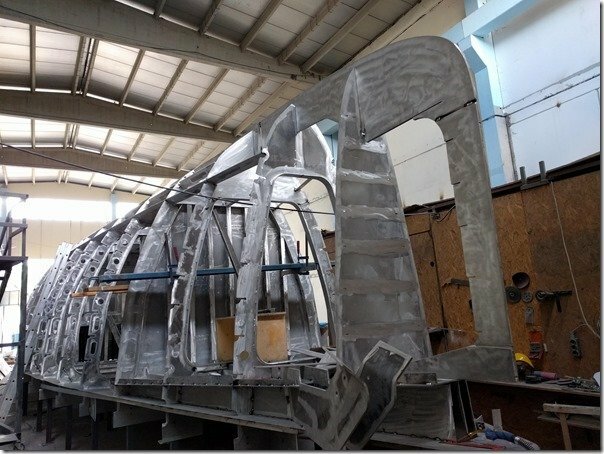 It is all made of 15mm plate which extends back over 1.5 meters into the deck framing and becomes part of a very rigid bow framing assembly. In future posts you will see how this bow roller is further reinforced with gussets on the sides to connect it the inner hull sides and become even stronger. Getting “up close and personal” here is a bit more of a close up view of the business end of the anchor roller cheeks. 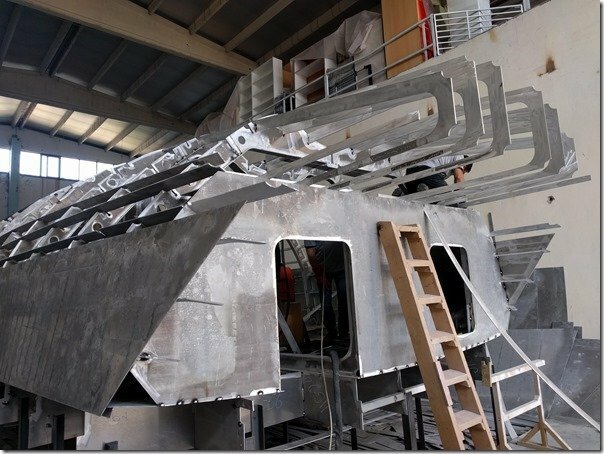 This aft view looking forward shows more of the construction and the flared out cheeks which will have an additional pair of AL pads welded on to provide a very solid surface for the blade of the anchor to snug up to and be able to take the brunt of large waves we will be piercing while underway. 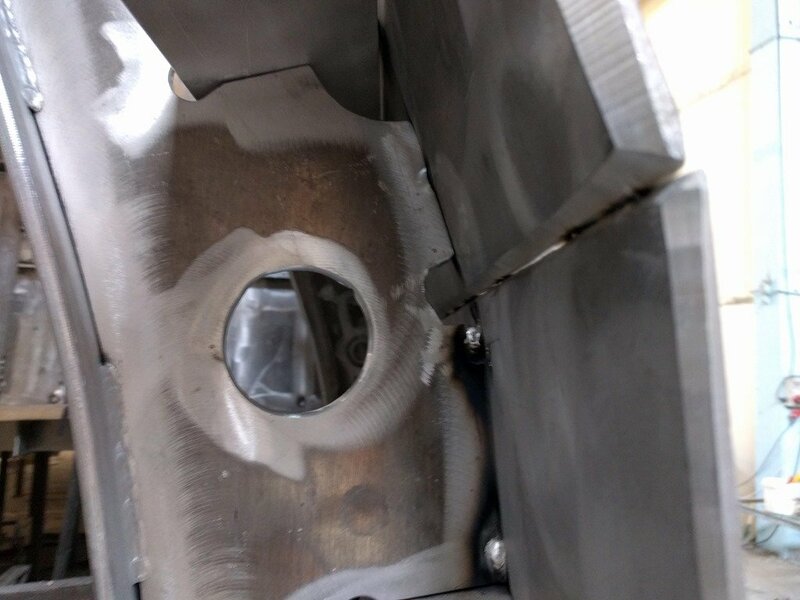 You can make out the two holes on the side which are for axle pins for the dual nylon/UHMW anchor rollers for the anchor and chain ride on as they come in and out. 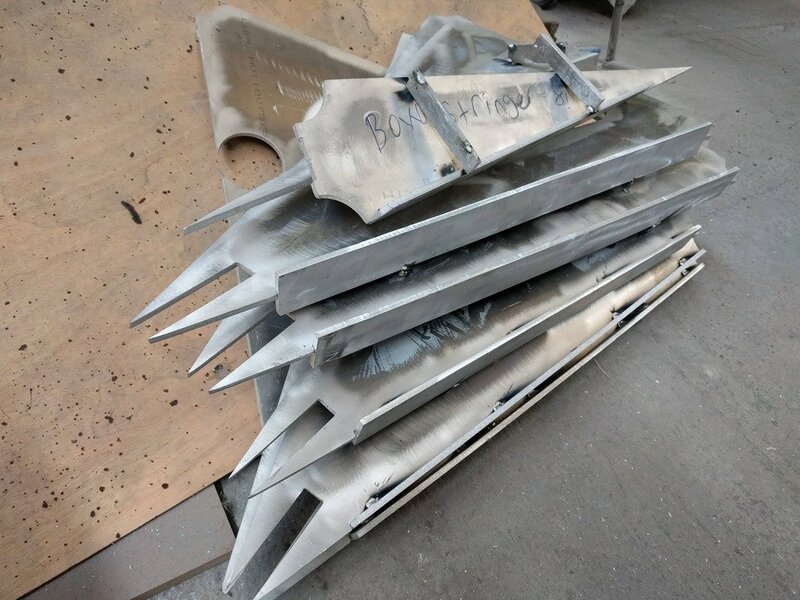 Off to the side of the bow is this stack of triangular bow stringers which are about to be fitted into those slots you might have noticed in the shots of the Stem Bar above. This is more examples of the interlocking “kit” like nature of this construction technique. The large slots at the peak slide around the Stem Bar and then the last 35mm/1.5” or so slides into those slots you saw above. Like this. That is Frame #1 and it was left loose so as to allow room for those triangular stringers to slide into the Stem Bar and then moved upright so each of the tabs in the aft end of the triangular stringers would snap into place into the little rectangular slots you can see if you look closely here. You’ll see here that the opposite Stbd. 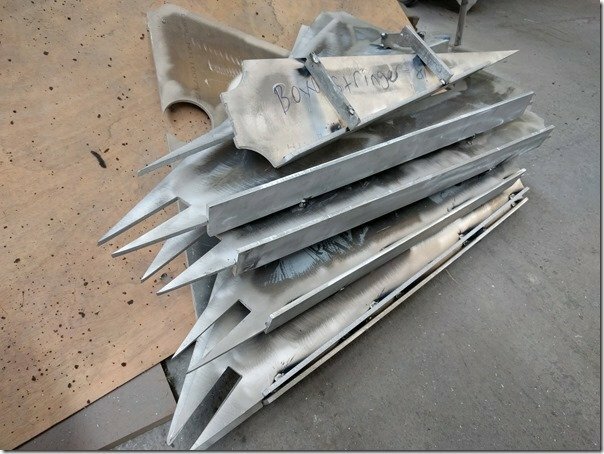 side is a bit different with these horizontal flat bars welded to the edges of each triangular stringer. 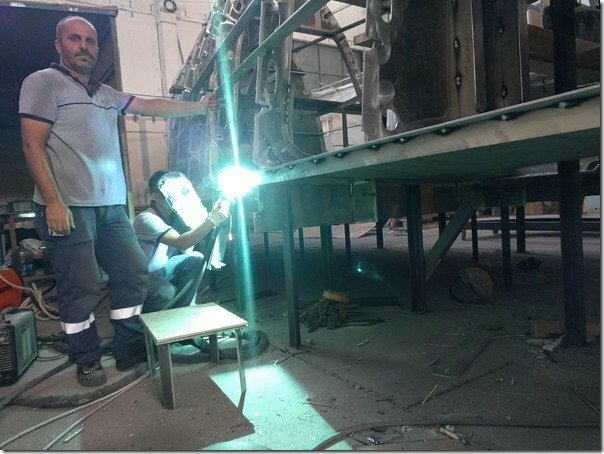 The bow hull plating will begin with the Port side, the one with no flat bars, and Sezgin the Master Welder can easily reach through with his MIG welder from this still open Stbd side and run his welds along each stringer. But once the Port side has been welded up he has no access to get in and weld the Stbd. 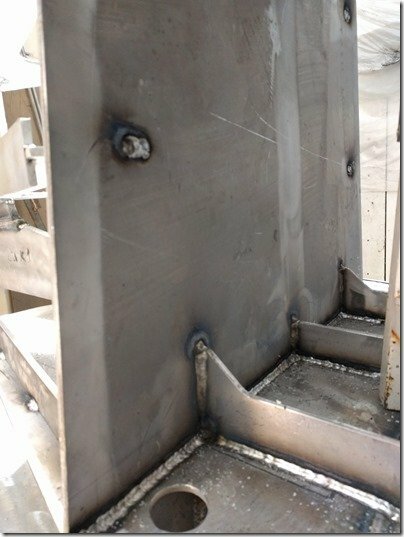 side hull plates, so the slot welding technique we talked about last week will be used where there are elongated round ended slots cut into the Stbd. hull plate which line up with these flat bars so Sezgin can fill each slot with weld and secure the hull plate to the stringers. 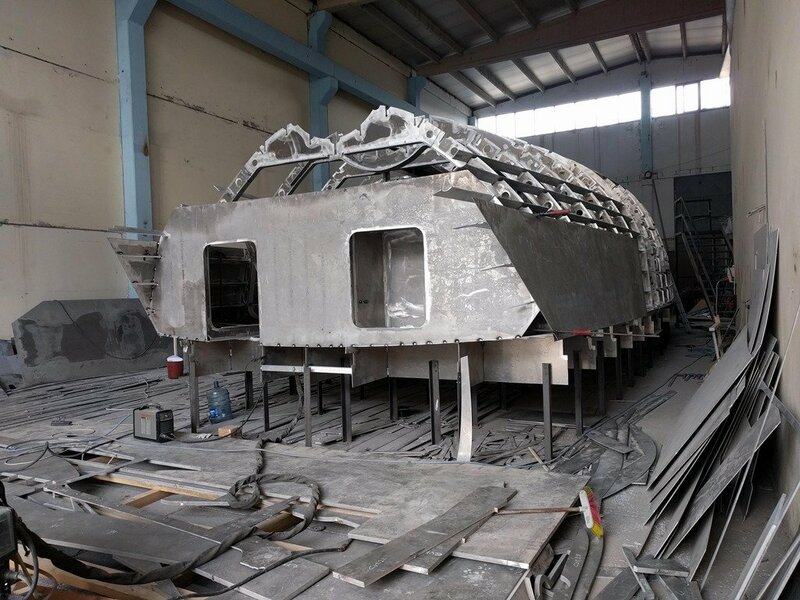 As with many such welds in the outer hull these will all be carefully ground flat and flush with the hull plate and become invisible. 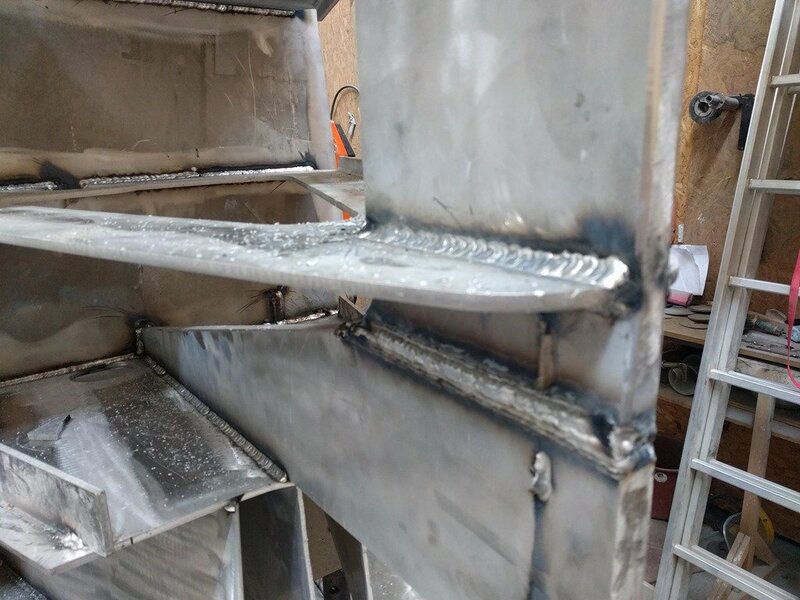 Literally hot off the press or MIG welder you can see some of the finished welds and appreciate just how incredibly strong this bow will be even before the 12mm/ 1/2” bow plating goes on. 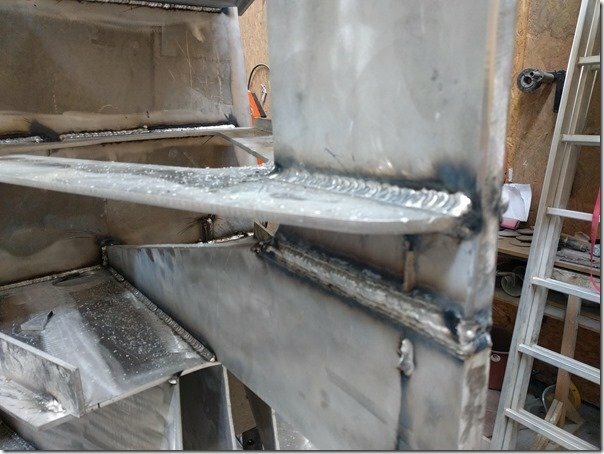 Looking forward from the backside of Frame #1, more of the finished welds and a good shot of how all those tabs in the aft edge of each stringer slot into the Frame bulkhead and get welded up. This is smaller in size but very similar to the slot welding technique I described above. OK, with the bow pretty much all framed in, let’s head aft to the other end of Möbius and rewind the clock to Monday morning to see where we start back there. While we have made a few changes to some of the details this earlier rendering is close to what the finished Swim Step will look like. Right side up of course! So now flip your brain once more and we’ll get back to the upside down reality views of the Swim Step. 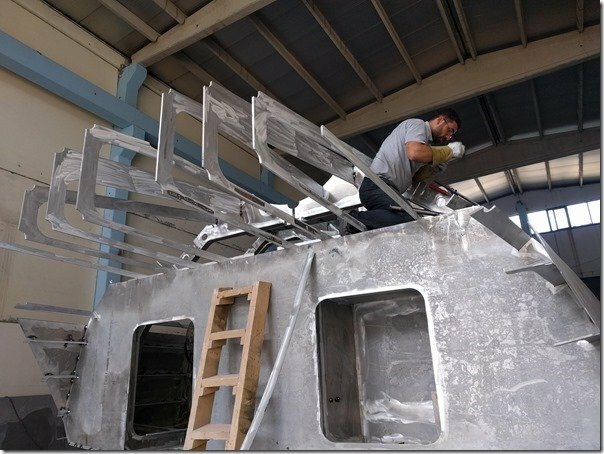 Uğur is busy slotting each stringer into the aft frames and the very aft end of the boat quickly starts to take shape. With most of the stringers which form the Swim Step now in place you can begin to see how this 1.4m/4.5’ long Swim Step will provide a great platform for getting on/off the Tender, diving off, snorkeling, fishing, etc. Can’t wait!!! As you can see the swim step also provides some significant additional storage space underneath. We will use this for longer term storage of items such as our spare CPP propeller blades and other such infrequently used items. 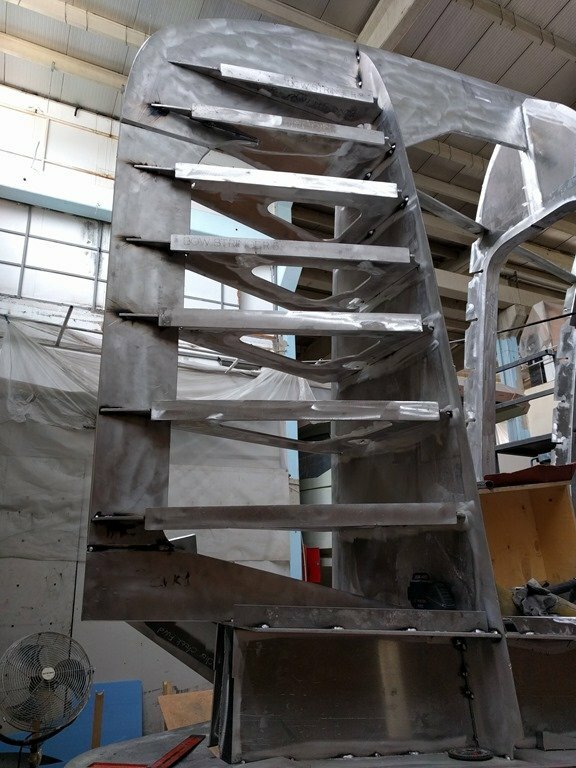 This is because we don’t want to put access hatches in the Swim Step deck as they introduce a possible leak and because they would need to be flush there would be a groove between the hatch lid and frame which would collect water and stay wet most of the time and become moldy and dirty. No thanks! 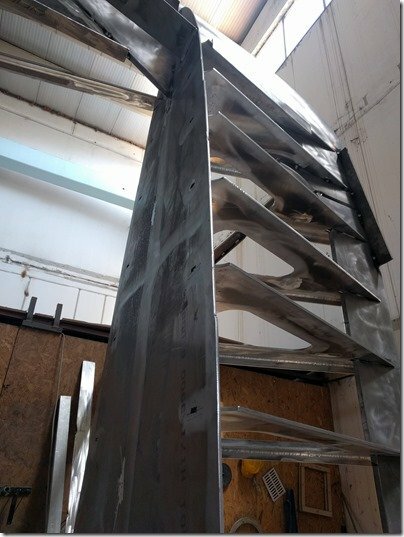 Therefore we will weld the Swim Step platform with no external access ports to keep it fully sealed from the exterior and nice and dry on the inside. Meanwhile along the sides, Enver and Umit are busy adding more 6m/20ft lengths of hull plates to each side. 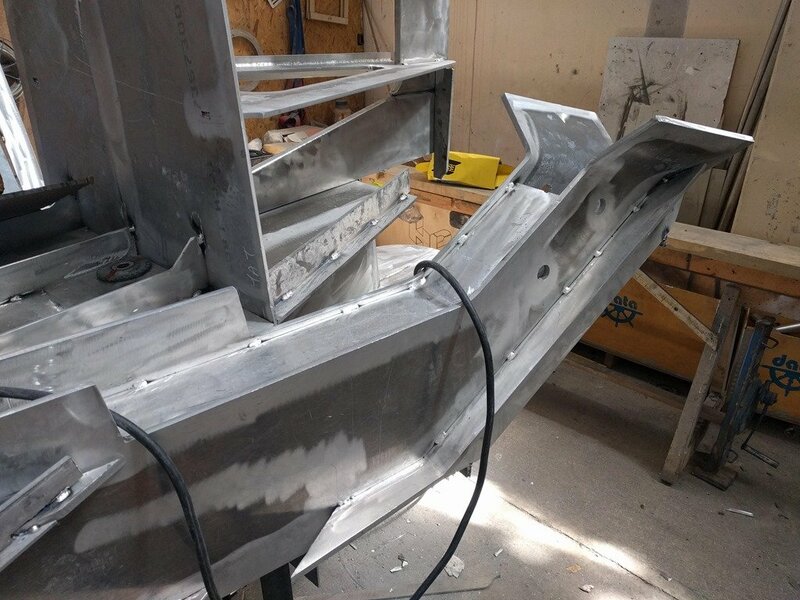 To prep the deck for this they temporarily weld in these lengths of flat bar and clamp the deck plate to it every 15mm/6” or so to ensure the deck stays completely flat as they tack the hull plate along the deck edge. With the deck edges all nice and flat the 2nd 6m/20’ length is now tacked in place. 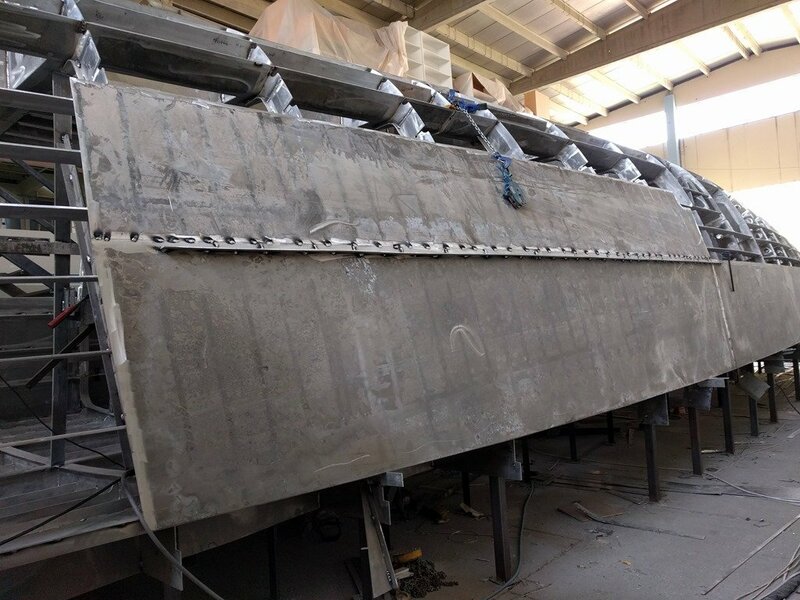 And soon thereafter the first of the 10mm thick plates is tacked in place. You can see another use of temporarily tacked in place flat bar along the lower 6mm plate to keep that edge perfectly flat as the upper 10mm plate is tacked to it. 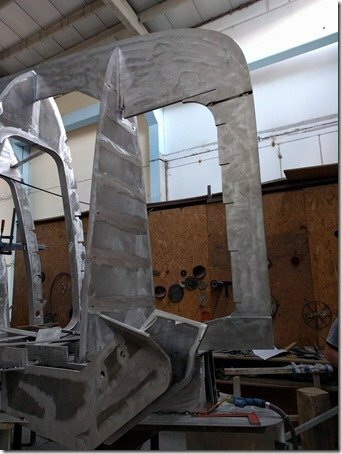 The framing for the future option of active stabiliser fins is in this area so the 10mm plate is notched for the thicker 12mm plate to be fitted as the hull curves down through the waterline and under the boat. In case you were wondering how the transition between different thickness hull plates is formed, this will show you how it works. 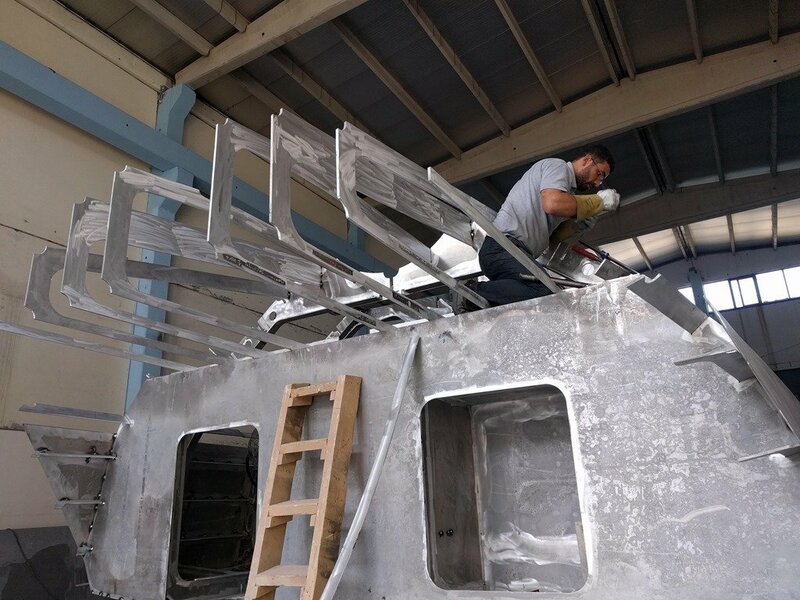 The frames have a notch cut in them where each transition from one thickness to the next will be and this allows for the two different thickness plate seams to stay flush and smooth on exterior of the hull. The small step between the two different plate thicknesses is welded up on the inside. 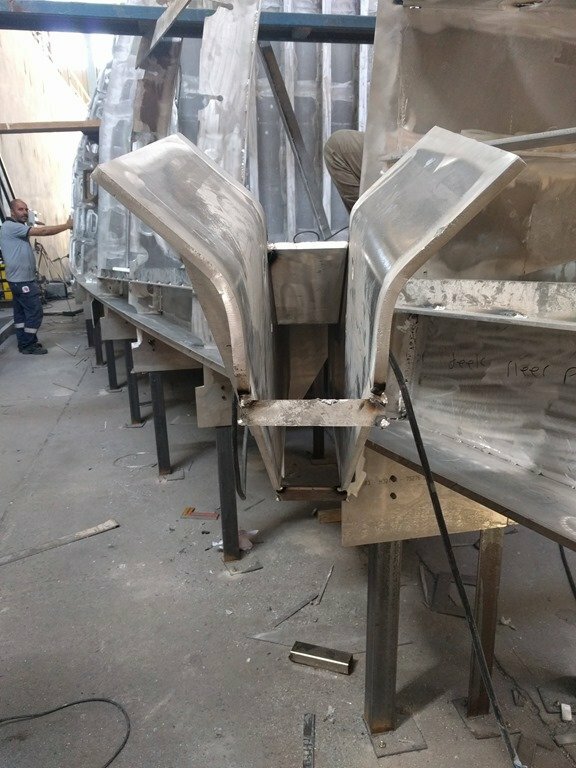 You can also see here how all the edges of each plate have been carefully routed with these 45 degree chamfers to create the V grooves on the inside for a full penetration weld. Nearing the end of the work week on Friday afternoon Umit is busy tacking in more of the 10mm plate. 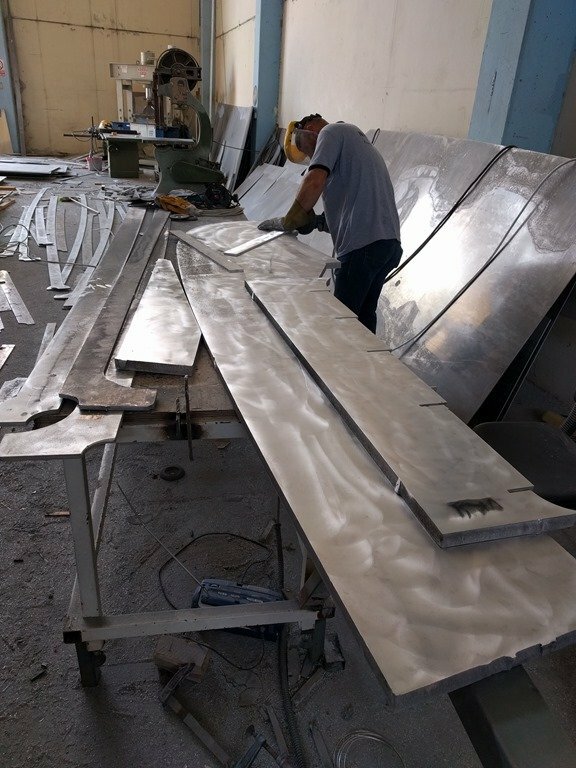 Ever present in the background is the endless careful preparation of each of the thousands of pieces so that they are all clean and smooth and ready for their turn to join their mates in the hull. And to add to the excitement and progress this week our container arrived from Miami containing all our worldly possessions. 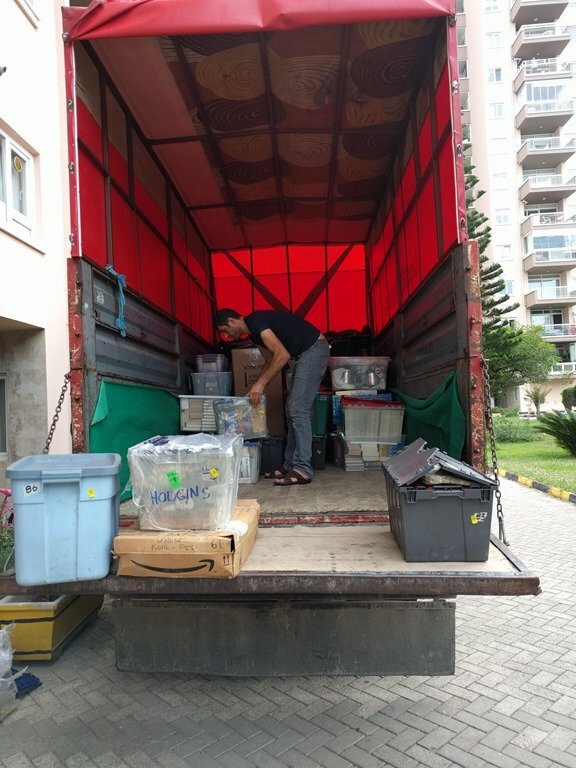 The container actually arrived here in Antalya last week but it took a week of bureaucratic paperwork and fees, fees, fees to get it on a truck and sent over to our apartment which is what you are seeing here. Burak, with his cell phone, was kind enough to come over and help out with some of the unloading and translations and in less than an hour we had all of it up on the elevator to our 9th floor apartment and stowed in one of our spare bedrooms to await our unpacking. The other half of the shipment is still in the container and will go to Naval shipyard with all my machines and tools and boat supplies which will ultimately end up on Möbius once she is built and ready to launch next year. So that is the week that was June 18-22 here with Team Möbius. Hope you enjoyed this weeks update and thanks again for joining us. Do please add your questions and suggestions in the Comments section down at the very bottom of this blog post. And as always, here is your reward for getting all the way through this or being smart enough to jump here first and watch this week’s synopsis video. See you again next week!